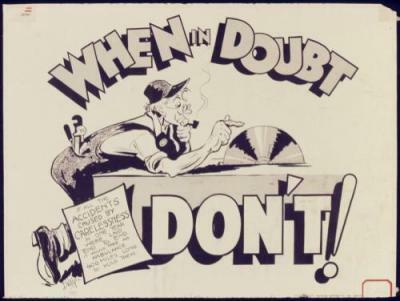 Good advice to the AP, from the War Production Board, circa 1942. Image public domain, via Wikimedia Commons. One of these is a real addition to the AP Stylebook. Which do you think it is? To describe those who don’t accept climate science or dispute the world is warming from man-made forces, use climate change doubters or those who reject mainstream climate science. Avoid use of skeptics or deniers. Climate change is preferable to global warming since flat earthers find the latter offensive. Don’t refer to creationism, as creationists feel it makes them sound like fundamentalist loons. Instead, use intelligent design. Scientists prefer to call those who reject heliocentrism geocentrists. Those who reject accepted astronomy say the term has the ring of self-centered arrogance, so prefer Copernicus doubters. Yes, according to a new update to the Associated Press Stylebook, a climate change denier is merely a “climate change doubter,” or at most “someone who rejects mainstream science” (perfect for pithy headlines). I’ve previously rebutted the claim that the term “denial” is connected to the term “Holocaust denial,” and it’s hard to see why anyone should accede to the ill-founded complaint that “denial” connotes Holocaust denial. I fear “doubter” fails to capture the mendacity inherent in outright “rejection of mainstream science.” Calling it “denial” is accurate, and has a strong basis in scholarship and is even preferred by some deniers. If deniers find the term offensive, they’d do far better to change their behavior than complain about terminology, and the AP shouldn’t humor them by adopting a term that’s less clear.